When you create a new post, it is in draft mode. 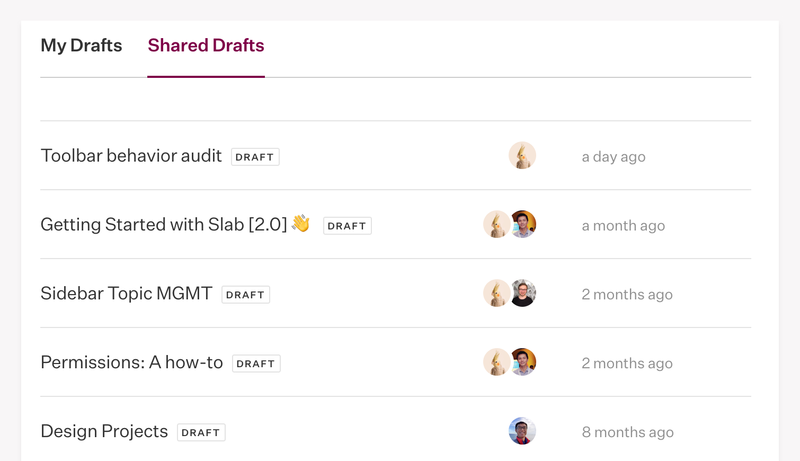 You can share the URL of the draft with anyone on your team and they will be able to view and edit. Once they view the post, it will also be added to their list of Shared Drafts and be able to search for it later. Once a post is published, its access is determined by the post's topics. A published post with no topics is accessible and searchable by anyone in your organization. A Private topic can only have other Private topics as subtopics. Open topics can have any type of topic as subtopics. 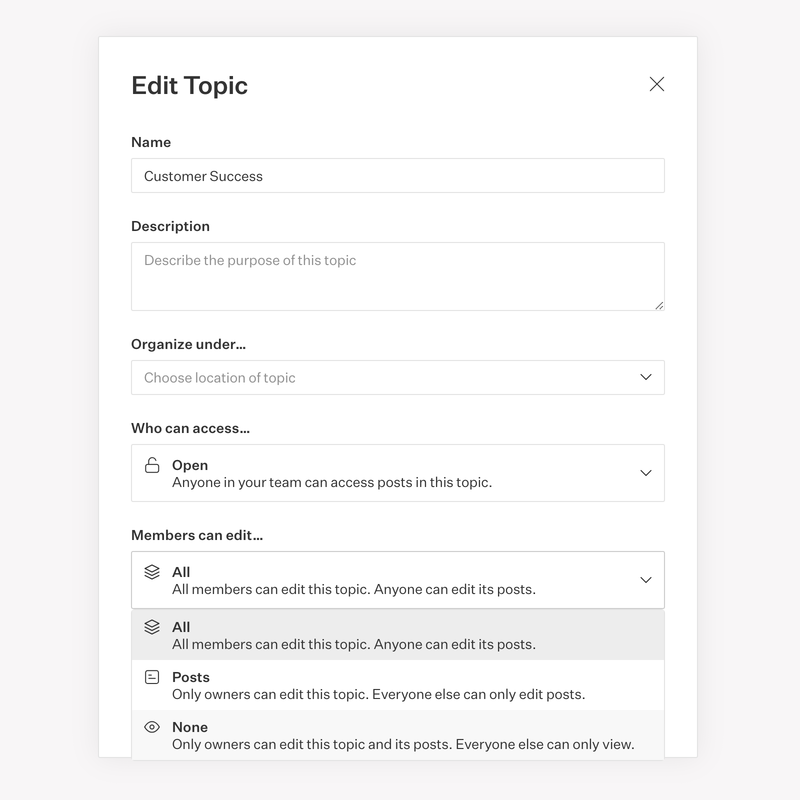 Edit the topic (can be disabled) including name, description, banner image, privacy, pinned posts. Site admins can join any topic and make themselves or others an owner, including private ones. 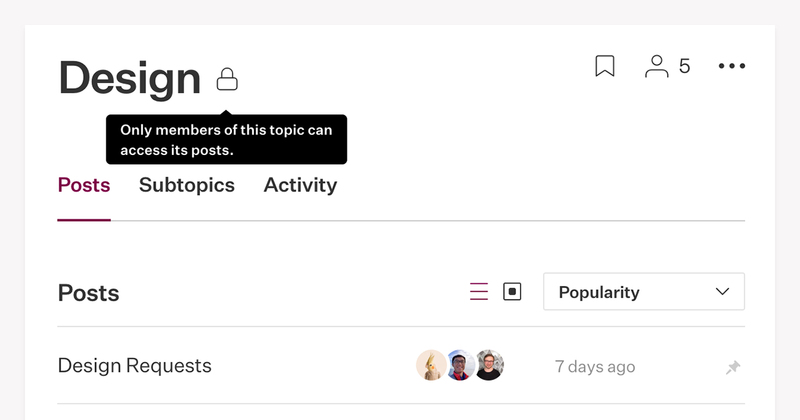 You can restrict who can edit a topic and its posts through topic membership and ownership. Configure this in the topic's Edit Topic modal. This is individually configurable in each topic and is not inherited by subtopics. An editable parent topic may have uneditable child topics and an uneditable parent topic may have editable child topics. Modifying the name, description, banner image, and "Organize under"
Topics apply additive access to posts. 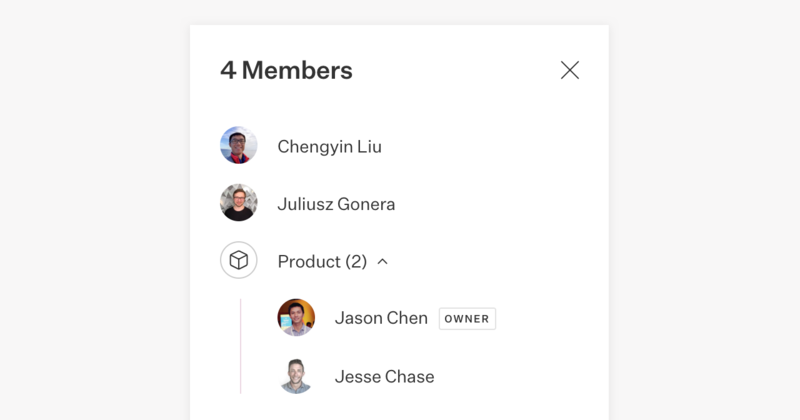 For example, if you have a private topics Engineering and Product applied to a post "Design Spec", both the members of Engineering and Product will be able to view "Design Spec". Similarly, in the above example, if Product was an open topic, everyone in your organization would be able to access "Design Spec". Both the conditions of private topics and drafts much be met for access. For example, if you have a draft "iPhone 20" and added a private topic "Upcoming Products", only members of that topic who also know the draft's URL will be able to view it. Those that only know the URL will get a permission error when they try to edit it, which will confirm the existence of the draft but will not reveal its contents. Slab has a helpful feature that turns linked post URLs into an embedded mention. Because the title of the post is included in a Slab post URL, the title of a post, when mentioned in another post, is not considered secret. For example, if a post "Features Roadmap" mentions another post "iPhone 20", everyone who can access "Features Roadmap" will be able to see the title and URL of the mentioned "iPhone 20" post. However only users that can also access "iPhone 20" will see a preview of its contents when hovering over this mention.